Are you concerned about your child's speech development? Is your child becoming frustrated with his or her speech errors? Are you interested in helping your child master difficult speech sounds at home? The Super Star Speech program was designed by a speech-language pathologist to help parents and children work with speech sound problems at home. The manuals are clearly written, easy to use and free of technical jargon. If you suspect or know that your child has an articulation disorder and you are willing to work with him or her consistently for a short time each day, I think you will find Super Star Speech to be an invaluable resource! Super Star Speech was voted the "Favorite Special Needs Product" by the The Old Schoolhouse Homeschool Crew for 2009/2010. 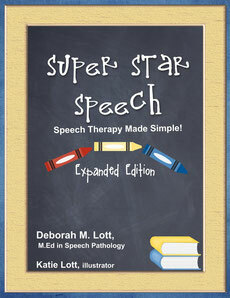 "Super Star Speech is a kind and thoughtful 'gift' from the author to parents of children with speech problems. There are very few speech therapy programs out there for the layman, and even many speech therapy websites are geared to the professional. Compared to what I have seen, this book is less expensive and more user friendly." "Finally I had the tools to help my children improve minor speech issues at home! I had no prior background in speech therapy, but with these books it was easy to know not only what to do, but how to model and practice each sound. The articulation test also explains which sounds should be mastered by what age in a typically progressing child, which was helpful. I was able to see where my son really needed to focus on first, the sounds he should have learned at a younger age but had not." Tristan at Our Busy Homeschool. "Showed me how to evaluate and to teach"
"I cannot tell you how helpful these books are to me and how much my two little guys have advanced.